The following is a guest post from Julie Ferrara-Brown, Director of Quantitative Analysis for WebShare. WebShare is one of our Website Optimizer Authorized Consultants. The case focuses on exploring more than just a single conversion. Often, optimizing a site means more than optimizing for a single conversion. Understanding how your test pages and sections affect bounce rate, ecommerce revenue, time on site, and all the other metrics provided by Google Analytics can be even more useful than a single conversion rate in painting a picture of how your site is used. Good news! You can use Google Website Optimizer and Google Analytics together to open up a whole new world of optimization and testing for your site. Catalogs.com worked with WebShare, a Google Analytics & Website Optimizer Authorized Consultancy, to plan and run a test that integrated both tools to collect and analyze a wealth of data. With a number of different monetization paths, the Catalogs.com website wanted to know not only whether alternative versions increase overall conversions, but also what impact would these versions have on specific types of conversions and the revenue associated with them. The aim of this experiment was to test different layouts across all of the sites’ merchant pages. The experiment was set up as a single variable, four-state MVT, encompassing every one of these merchant pages. Three variations were created, and each merchant page was available in one of its three formats by using different file extensions (.alpha, .beta, and .gamma). The test variable was actually just a piece of script that controlled which version of merchant pages a visitor would see. This, however, simply told us that Beta was more likely to result in a conversion, regardless of type or associated revenue. Enter Google Analytics. After creating a segment for each of the variations, it’s simply a matter of applying those segments to any report in Google Analytics and setting the appropriate date range. Now we can see, side-by-side, data for all the variations in any of Google Analytics’ reports. As an analytics platform (and not a testing platform), Google Analytics was not designed to perform the necessary statistical analysis to evaluate this data, but with the numbers it provides, you can perform an enormous amount of offline analysis. Let’s take the case of the bottom line, be-all, end-all metric: Total Revenue. For all the statisticians out there, in this particular case an F test blocked by day was performed to compare means. The results can be seen in the following analysis. What this boils down to is that circles that do not overlap or barely overlap represent a significant difference, and in this case the Beta variation is statistically our best variation in terms of generating revenue. Why Look at Lots of Metrics? Although we’ve only shown revenue analysis here, it’s important to note that performing this kind of analysis on a number of different metrics can really help you understand your visitors and their experience. For example, during this test we also found that the Beta version (the version that provided more conversions, more high value conversions, and more revenue) also had the worst bounce rate! Just because a visitor doesn't leave a site from the first page they land on does not mean they are going to convert. Depending upon your test type and implementation, there are a number of different ways to integrate Website Optimizer experiments with Google Analytics, and hopefully this post has helped to demonstrate the power of having all that wonderful data available in your testing. Thanks to WebShare and Catalogs.com for sharing this case study. A/B & Multivariate Testing really helps in continuously improve the websites we work with, but yes, without analytics integration you only get the answer to "Who" won, not "Why". Analytics can really provide this. It provides not only the increase of different conversions but also the impact in any KPI that you are following and is important for your business. What was used for the F-Test? I can run the FTEST formula in Excel. I even have a easy way to pull data from Google Analytics with excellentanalytics.com, but it would be nice to have a graphical representation of the results similar to the example given in the case study. Thanks for posting this. Is this really a case where WSO is really not too useful? It looks like the benefit of WSO is to ensure stickiness of the treatment to the visitor. Other than that I am not sure why you would need to use WSO since it would be a snap to add the random extension calls to the page and the ANOVA is being done externally. 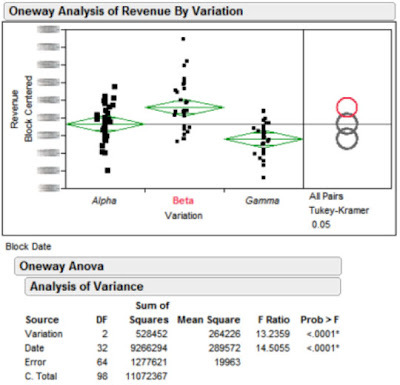 Charles, We used JMP statistical software to perform the analysis. However it was a standard F test with blocking so you don't have to have JMP to duplicate this analysis. Matt, GWO was extremely useful in this case for 3 reasons, 1)It provided conversion rate data, 2) without GWO we wouldn't have been able to easily split the traffic randomly between all combinations, and 3) it manages cookies to make sure that once you've seen a variation you always see that variation. Hope that helps. You are welcome to comment here, but your remarks should be relevant to the conversation. We reserve the right to remove off-topic comments, or self-promoting URLs, and vacuous messages. Please keep your comments relevant, friendly, and respectful. We moderate all comments so you may not see your comment show right away. The Official Google Website Optimizer Blog is powered by Blogger. Start your own weblog.